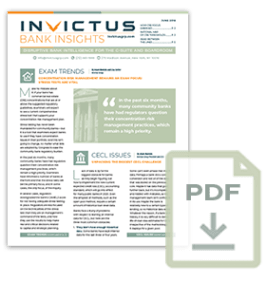 While smaller banks are in a better position to benefit from CECL from a technical perspective, they will struggle the most with the implementation due to a general lack of sophistication and the relative cost of using third-party tools. Smaller banks may also find themselves caught in the middle of two conflicting forces. In one corner, the service providers that stand to benefit the most from CECL are using scare tactics to convince banks to spend oodles of money today on a so-called solution. “Best start yesterday or else you are doomed,” they say. In the opposite corner, overly passive and reactive auditors are advising banks to wait until more guidance is available. The right answer for community banks is somewhere in the middle. Understand the role of vintage in CECL. Don’t confuse it with seasoning. The risk profit of a loan is primarily a function of the economic conditions that existed on the day the loan was originated. What’s most important is the ability to measure the economic conditions that exist in the expected environment underpinning your CECL model against the economic conditions that existed for each vintage. In 2011, economic conditions were worse than in 2007. Therefore, the 2007 loans should require more of a reserve than loans originated in 2011, but not as much than a loan written in 2016. Thought leadership on how you adapt CECL to your institution will be rewarded. Be aggressive on data gathering, but don’t buy a black-box solution. Your CECL system can be simple; don’t believe the hype about how it has to be complex. The best way to prepare for CECL is to start small, and build out. Believe it or not, most banks have the ability to run a very simple CECL analysis right now. The secret to CECL will be loan portfolio segmentation. If you get your segmentation right, you will find that it’s 80 percent of the battle. Mock calculations can then be performed on each segment. The assumptions driving the model might not be 100 percent accurate, but at least this would give your bank a starting point to determine what additional data you need to improve such assumptions. Then, as you get more data, you run more mock calculations until you get it right. That would enable your bank to evolve its calculations by the time CECL is implemented. The worst thing you can do is try to build a perfect system on Day One. That is what will lead to wasted money and time. Invictus performs a quarterly analysis on all FDIC- insured banks in the country to assess their best approach to M&A. The analysis is based on the post-stress capital ratios of banks, plus the Invictus Ratio, which generates a gauge of five categories: Balanced, Should Buy, Must Buy, Should Sell, Must Sell and Outlier. (This is not a prediction of what banks will do, but rather an indication of what they should do to maximize shareholder value.) The latest “Leaders and Bleeders” analysis, based on 2016 Fourth Quarter data, shows a slight increase in the number of Seller banks and a slight decline in Balanced banks, most probably because of the low interest rate environment. Loan income declines each quarter as older, higher interest rates roll off and are replaced with lower rate loans. Broadly, the Seller banks have poor post-stress capital ratios, lose capital fast under a stress test, and do not achieve good returns on their required capital (where required capital is based on a stress test). Buyer banks are in better shape from a capital point of view, but should consider acquisitions of more efficient banks (those with a higher Invictus Ratio) to improve the bank’s performance. Balanced banks have good post-stress capital and good efficiency To see where your bank stands on the Invictus Gauge, please contact MandA@invictusgrp.com Statewide graphs of the Leaders and Bleeders analysis can be found on the Invictus website. The ruling is significant because President Trump can shape the future of bank regulation by choosing who leads the various bank supervisory agencies. Cordray’s term ends next year. Comptroller of the Currency Thomas J. Curry’s term ends in April, and FDIC Chairman Martin J. Gruenberg’s term ends in November. Also key is who Trump will choose to replace Federal Reserve governor Daniel K. Tarullo, whose resignation is effective in April. While Dodd-Frank stress tests are not required for banks with less than $10 billion in assets, the scenarios often signal regulatory interests and direction that can be valuable for community banks. Continuing its effort to attract investors in new banks, the FDIC has issued a new handbook to guide applicants through the deposit insurance process. The guide includes answers to questions that were asked during de novo outreach meetings conducted by the FDIC in the fall of 2016. It also includes advice from CEOs at successful de novos. To win approval for a new bank, it’s important to develop a business plan, determine the right amount of capital that must be raised, and secure a good team of directors, officers and management.